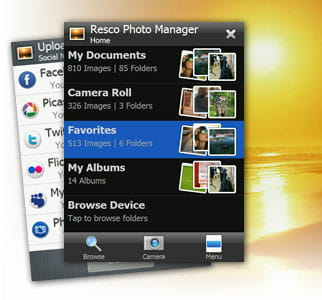 Resco Photo Manager is a powerful image file manager for mobile phones. It provides a range of tools allowing the user to better organize their image collections. It is easy to use. Resco Photo Manager is featured with a viewer allowing users to look at pictures. This program supports the most popular image formats such as jpeg, png, bmp and more. This application is built-in with some basic tools for image editing. Apart from that, Resco Photo Manager enables to rotate (left, right, up and down) or zoom images in and out. The user has full control of images and can move, copy them at any time. This process enables to easily search for images. To facilitate picture management, Resco Photo Manager automatically creates four databases including My Documents, Camera Roll, Favorites and My Albums. As we have said, Resco Photo Manager is full-featured. Via its interface, it has the ability to convert files between supported formats; you can resize pictures, etc.